My ancestors herded sheep in the Tibetan hill country while the huge Tibetan Mastiff stood guard. Tibetan Terriers were also considered good luck charms, of sorts, and were given to travelers as �good luck pets�. I�m not real sure why they call me a terrier, because I�m not really one at all, but I do have some of the terrier fearlessness and assertiveness. My long coat comes in lots of pretty colors and requires frequent brushing in order to keep it free of mats and tangles. My relatives who still live in Tibet have their hair clipped like sheep in the summer and their hair is mixed with yak�s hair to be woven into fine, strong cloth. When fully grown, I am between 14 and 16 inches tall (35.6 to 40.6 centimeters) and I weigh between 18 and 30 pounds (8.1 to 13.5 kilograms). We have no Tibetan Terrier Breeders listed at this time. 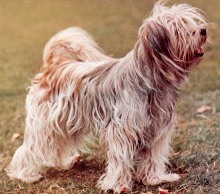 Click here to place your Tibetan Terrier Ad!